Arsenal moved into a three-way tie on points for third in the Premier League with a 3-1 win over Leicester City today. More than anyone else, the Gunners have Mesut Özil to thank for that. Pierre-Emerick Aubameyang may have scored Arsenal’s go-ahead goal, and Héctor Bellerín may have gotten the assist, but this comeback victory was all Özil. 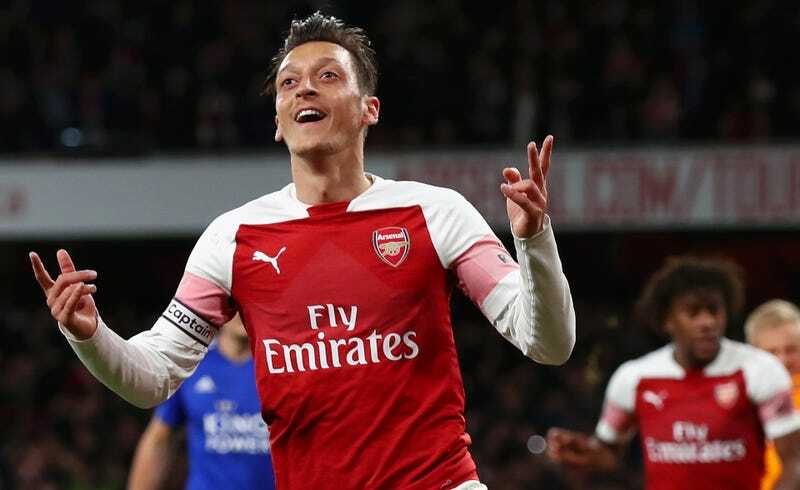 Özil didn’t technically get the assist on the goal that gave Arsenal’s the lead, but his through pass to Bellerín, which with one smooth swing of his foot eliminated Leicester’s entire left side from the play, was the pass that made the rest possible. Minutes later, Özil did get the assist on the goal that slammed the door shut on Leicester. After running centrally to get into a move he had started with a nifty little flicked pass, Özil played a brilliant dummy on an incoming pass to let it run to the feet of Alexandre Lacazette. Lacazette spotted the continuation of Özil’s run and sent him the return pass, which allowed Özil to tee up yet another for Aubameyang. Özil can be a polarizing player, since he’s not particularly well-rounded and tends to look listless and bored whenever Arsenal are losing a big game (so, whenever they play a big game). But good lord, when he’s cooking, he can be one of the most exciting players on the planet. A confident Özil is an absolute killer, and this tricky finish on the equalizing goal he scored in the first half was the hallmark of a supremely confident player. Seeing Özil like this is red meat for Arsenal fans, especially since the early signs pointed to a fractured relationship with new boss Unai Emery. Two months ago, the two seemed to hate each other. Now, Arsenal have won seven on the trot in the league and 10 overall. At this stage in his career, Özil isn’t going to suddenly morph into a more “modern” soccer player, one who tracks back and breaks up counterattacks as often as he spurs them on in the opposite direction. He’s something of a square peg, which can make it tough to squeeze him into the round hole Emery places in the center of his famously disciplined and labor-intensive midfields. But the German’s talent is so staggeringly self-evident and he creates extremely good chances when he has the ball around the box, so it’s impossible to keep him out of the side. There’s something to be said for being well-rounded, but if your team’s most “limited” player is one who hits killer passes for fun and prefers to create tap-in goals for teammates rather than getting sweaty running backwards to obstruct the path of an overlapping full back, well, you should probably play that guy every match anyway and watch the wins pile up. Today’s match is as well as Özil has played all year, and if he can carry this form on, Arsenal could very well hang onto their top four position—at least until the end of the season comes around and brings with it their inevitable, heartbreaking collapse.